ST. PETERSBURG, Fla. (AP) Even after winning his final start of the year, Chris Archer made it clear he had much more in mind. 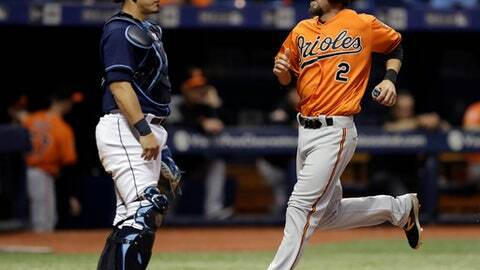 Archer won for the first time since Aug. 22 and Brad Miller hit a three-run homer to lead the Tampa Bay Rays over the Baltimore Orioles 4-3 Saturday night on the next-to-last day of the season. ”Good note or bad note? We had a losing season, so it’s really not that good of a note,” Archer said. The right-hander made his 34th start to give him 67 over the past two years – most of any pitcher in the majors. He totaled 201 innings, exceeding 200 for the third straight season. ”He prides himself on getting out there and staying out there,” Rays manager Kevin Cash said. ”I’m really just trying to grind it out,” said Miller, who needed two hits to raise his batting average to .201. ”Things haven’t really gone how I planned to go this year, but that’s not going to take away from my attitude. Colome, who earned his first save in a week, will be the first Rays reliever to lead the majors in saves. Brad Boxberger (2015) and Rafael Soriano (2010) led the American League. With a save on Sunday, Colome can tie Fernando Rodney’s 2012 team record for one season. Rays: Cash said he will give his regulars the option of whether to play in Sunday’s season finale. A previous version of this story was corrected with the date of Archer’s last win.